Hobart has emerged as Australia's best performing capital city based on growth in dwelling values over the past twelve months, according to CoreLogic's August home value index. 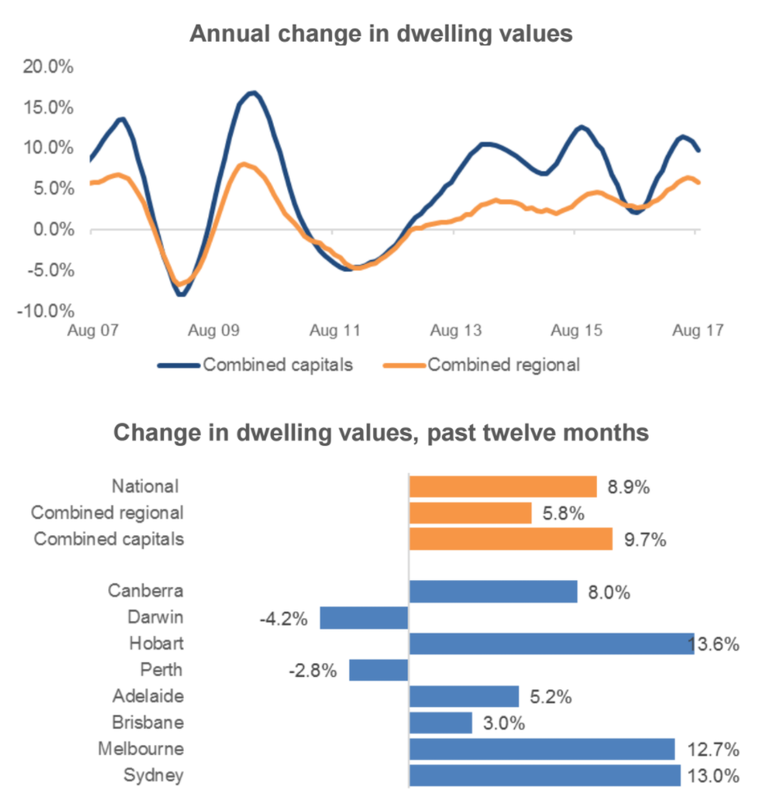 National dwelling values remained flat during August, with capital city values edging 0.1% higher; regional dwelling values slipped 0.2% lower. "We’re seeing capital gains in markets like Sydney, which were previously very strong, now being weighed down by affordability constraints and tighter lending conditions," CoreLogic Head of Research Tim Lawless said. "The knock-on effect is a curb in investment credit growth and higher mortgage rates for investment and interest only mortgages. “Looking at the past three months, it provides a clear indication of the trends, with national dwelling values rising by only half a percent over the three months to August 31 - the lowest rolling quarterly gain since June last year. "The national market moved through a peak rate of growth during the three months ended November 2016, when dwelling values were rising at the rolling quarterly pace of 3.7%,” Lawless said. The slowdown in growth conditions is most visible in Sydney, where housing values had been growing strongly. Since values started rising in 2012, the typical Sydney dwelling has seen its value rise by 75%, equating to an approximate dollar value gain of $521,000 on the median dwelling valuation. Sydney’s quarterly growth rate peaked over the three months ending October 2016 when dwelling values jumped by 6.3%. Since that time, the rolling quarterly rate of appreciation in Sydney dwelling values has consistently eased, reaching the current rate of just 0.3%. In Melbourne, the housing market has been more resilient to a slowdown. This is evident in the hedonic index results as well as auction clearance rates, which have consistently been above 70%. Inventory levels also remain exceptionally tight across the Melbourne market. Melbourne’s quarterly rate of growth has slowed since peaking at 4.4% in November last year, however the most recent three month period has seen dwelling values rise by 1.9%, less than half the peak rate of growth but substantially higher than Sydney’s pace of capital gains. 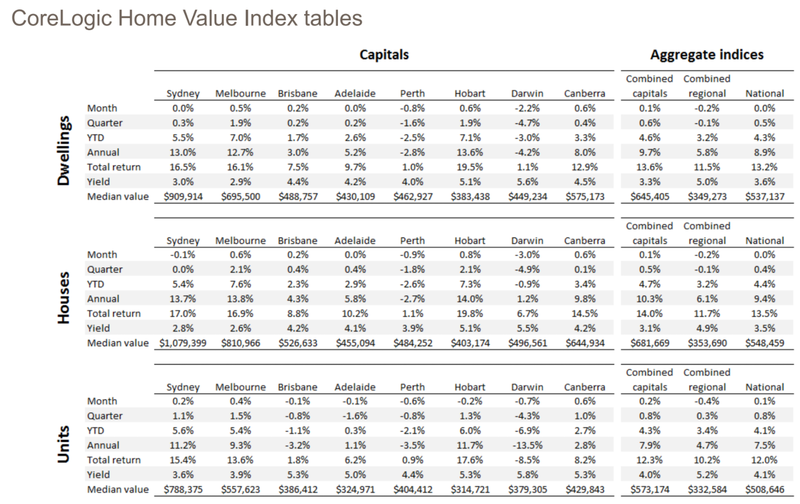 While the trend in capital gains has eased across the largest capital cities, in Hobart the market has gathered some momentum; the annual pace of capital gains, at 13.6%, is now the highest of any capital city. According to Lawless, the annual growth rate for Hobart hasn’t been this high since 2004, and the sheer affordability of housing is likely one of the key drivers for Hobart’s values appreciation. With a median house value of just $403,174, Hobart houses are approximately half the value of Melbourne and almost two thirds lower than Sydney house values. 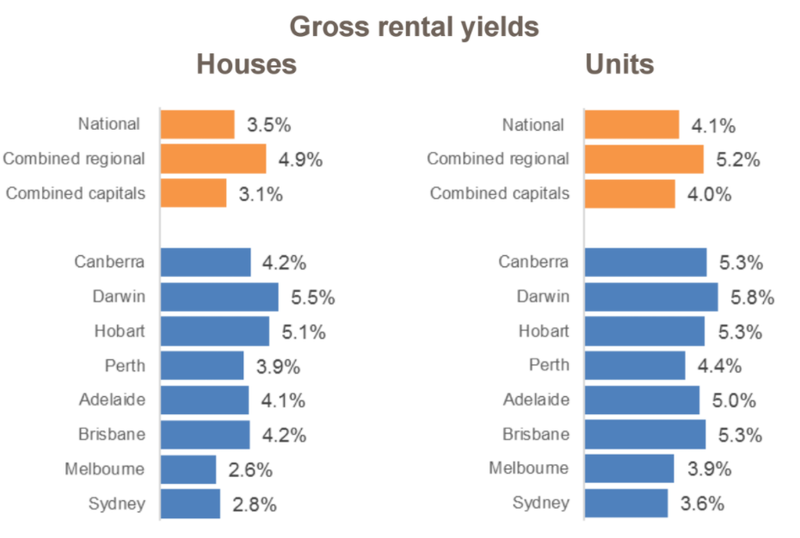 In addition to the strong capital gains, Hobart rental rates have also risen, providing a solid rental yield and pushing the total return well beyond the other capital cities. “Record low yields are largely a capital city phenomenon, with yields across the combined regional areas of the country tracking 165 basis points higher than the combined capital city yield,” Mr Lawless said. 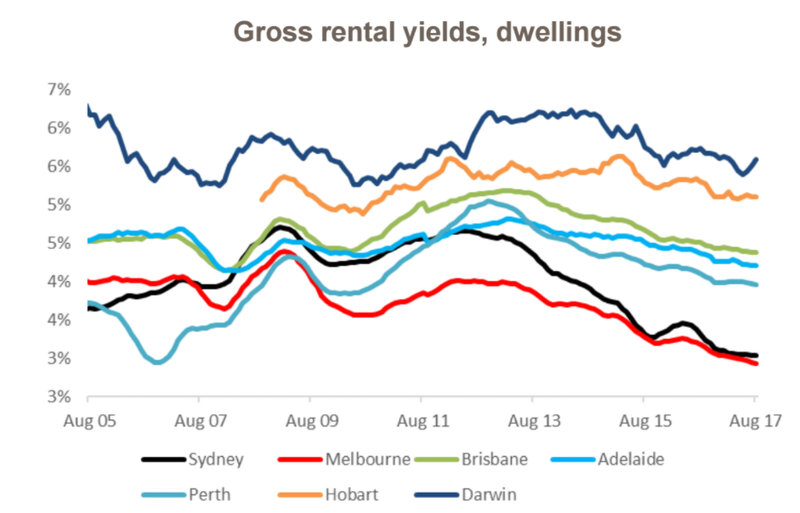 While there was a reduction in gross rental yields across each of the capital cities over the past twelve months, only Melbourne (2.9%) and Sydney (3.0%) are recording rental yields at record lows. 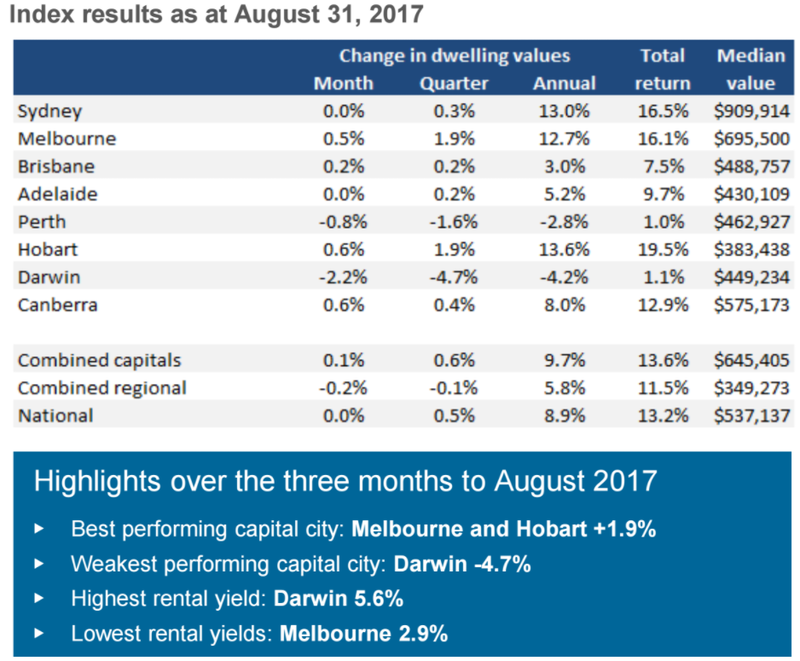 To provide some context about why yields are so low in these cities, dwelling values in both cities are up approximately 13% over the past twelve months while rents only increased by 4.7% across Melbourne and 4.0% across Sydney. “Slower growth conditions in Sydney, and to a lesser extent Melbourne, are likely to be a welcome evolution in housing market conditions by policy makers such as the RBA," Lawless said. 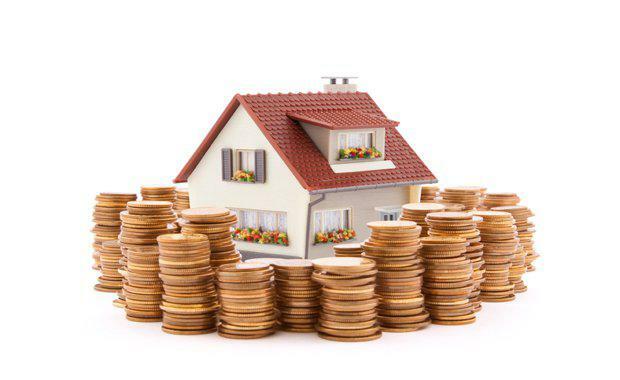 “The growth cycle in both cities has run for five and a half years, providing a substantial wealth boost for home owners but also creating much frustration for those who don’t own a home. “The policy settings around investment credit growth and new interest only settlement targets have seen credit policies tighten and pushed mortgage rates higher for both investor and interest only loans. These disincentives are likely to continue to weigh down investment demand which will have a more pronounced effect in those markets where investors are most concentrated,” Lawless said.